Marshmallow (Essie) and Rainbow Connection (OPI) have been trying to get together for a long time, but the retailers they're sold through just won't put them near each other. It's not fair. Rainbow and white just never get the chance. They're always polar opposites on the polish display stand, and frankly, I'm sick of it. Let's fight this! Let's get rainbows and whites together at last! END POLISH SEPARATION! Take a lesson from The Posh Polish, and lay these two polishes in the same bed...nail bed! I LOVEEEEE THIS!!! 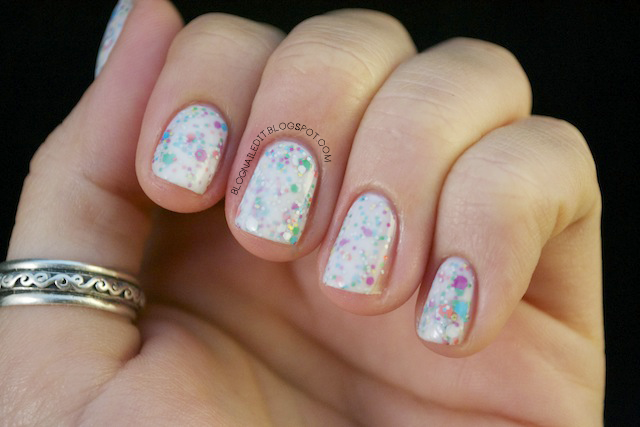 Now I wanna buy Essie Marshmallow just to try this out! i love this! how playful! I already wanted to buy Marshmallow only for milky glitter layering purposes, you just made me want it more! I looove jelly sandwiches and I especially love white with color. Very pretty!